Coming off a second consecutive embarrassing knock-out final thrashing, this time in a preliminary final, the Cats and Chris Scott entered 2018 feeling the heat, holding just three September victories to their credit since they won the 2011 premiership over Collingwood. After the return of prodigal son Gary Ablett excitement was at fever pitch down at Kardinia Park, the two-time Brownlow Medallist pulling on the blue and white hoops again after 110 games with the Gold Coast Suns. With a midfield featuring ‘the holy trinity’ of Ablett, fellow Brownlow Medal winner Patrick Dangerfield and fearless Geelong skipper Joel Selwood, the Cats were a flag fancy going into 2018. What followed was a fairly standard season. 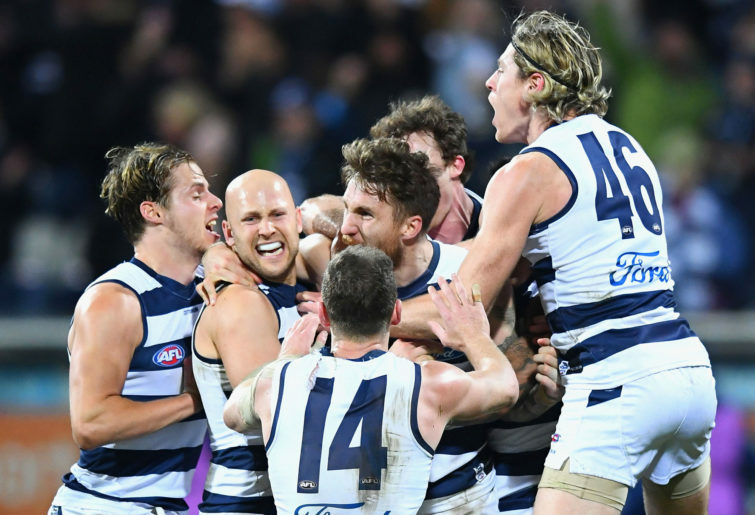 After occupying a top-four position at the conclusion of Round 12, the Cats spluttered to a 5-5 finish to the home-and-away season, taking out eighth spot on the ladder and setting up an elimination final against Melbourne at the MCG. What followed was yet another poor showing in a final – with Geelong booting just six goals for the match as they went down by 29 points. Despite the Cats’ inability to stand up in big games, coach Scott was awarded a lengthy contract extension, tying him to the club until the end of 2022. In a thrilling Carji Greeves Medal night, ruckman-turned-defender Mark Blicavs became the 25th Geelong player in history to win multiple best and fairest awards, narrowly defeating first-year midfielder Tim Kelly and Dangerfield in equal second by half a vote. 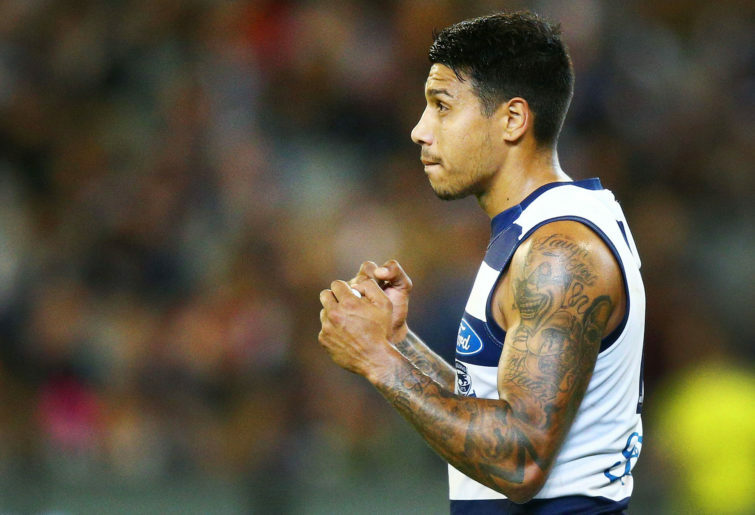 Geelong bid farewell to a number of players at the end of their season. Jordan Murdoch and Daniel Menzel were both delisted after 108 and 73 games respectively. Forwards Cory Gregson and Stewart Crameri were also axed, as were Ryan Gardner, Timm House and Matthew Hayball. 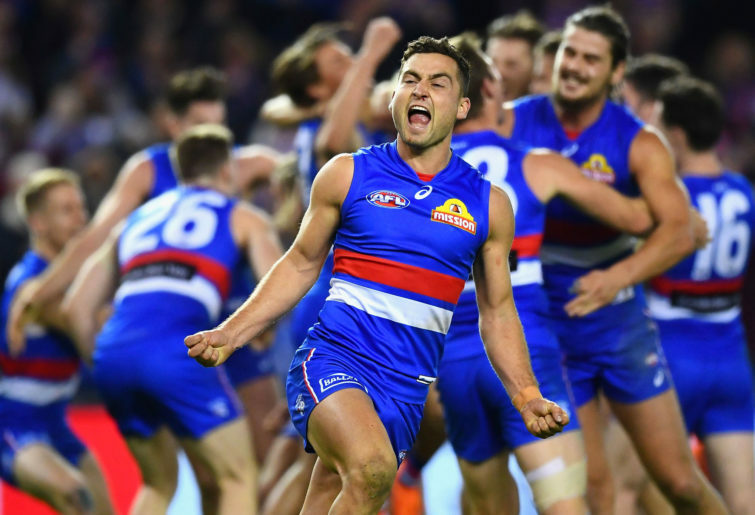 The Cats were one of the first clubs involved in the free agency period, signing Western Bulldogs premiership player Luke Dahlhaus. A few days later, the mercurial but often injured small forward Lincoln McCarthy was traded to the Brisbane Lions along with picks 55 and 59 in exchange for selections 43 and 62. In a deal with Carlton, who were given special early access to sign state league players, Geelong picked up South Adelaide forward Nathan Kreuger in exchange for pick 43. The Cats then signed Sydney forward Gary Rohan, who was traded for pick 62, before sending George Horlin-Smith and Jackson Thurlow to Gold Coast and the Swans respectively, getting late picks back for both players. West Australian midfielder Tim Kelly requested a trade home to the reigning premiers West Coast, but after a lot of drama throughout the trade period, no deal could be brokered. With their opening pick in the national draft coming at selection 15, the Cats opted for Claremont youngster Jordan Clark. At picks 48 and 50, Geelong signed Norwood pair Ben Jarvis and Jacob Kennerley, before selecting Darcy Fort and Jake Tarca, both also from the SANFL. With their final selection, Oscar Brownless officially became a Cat, following in the footsteps of his father Billy, who played 198 games and kicked 441 goals for Geelong. With Jack Henry and Mark O’Connor both elevated to the senior list, Geelong made just one selection at the rookie draft, picking up Tom Atkins from their VFL side. Irishman Stefan Okunbor joined as a category B rookie, as did Blake Schlensog, who was a member of Geelong’s Next Generation Academy. Already missing key defender Lachie Henderson due to a knee injury, there was a feeling of dread amongst Geelong supporters when Harry Taylor went down with a nasty foot injury in the opening match of the season against Melbourne. However, this particular cloud had a major silver lining, with experienced utility Mark Blicavs sent to defence to cover the gaping hole both of his teammates had left in the backline. In a marvelous year, Blicavs became one of the competition’s most reliable defenders, completely blanketing some of the best forwards in the game and helping the Cats become the number one side in the league in terms of points against. His year was rewarded with his second Carji Greeves Medal, while he was unlucky not to be named in the All Australian team. Up the other end, it was a terrific season from big Cat Tom Hawkins, who managed a podium finish in the Coleman Medal behind Jack Riewoldt and Ben Brown. In arguably the most consistent year of his career, Hawkins was particularly damaging in between Rounds 7 and 19, where he put through 42 goals across 11 games, including back-to-back hauls of seven. Not only will Hawkins again play a prominent part as Geelong’s most dangerous goalkicking option, he will assist the development of fellow forward Esava Ratugolea, who showed great signs in an injury-interrupted debut season last year. Perhaps one of the biggest criticisms of Geelong’s game style is the lack of a genuine ruckman. 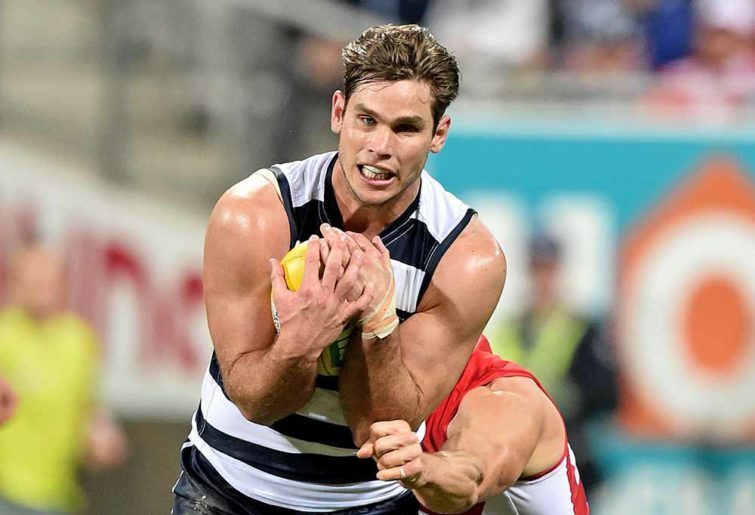 Rhys Stanley enjoyed a strong campaign playing as the Cats’ main big man, but as has been the case too often in his career, the 28-year-old was cut down by injury at different stages of the season, with a calf complaint ruling him out of Geelong’s elimination final against Melbourne. 206cm Zac Smith fell out of favour last year, managing just three games, with the Cats turning to local product Ryan Abbott after Stanley’s late-season injury. Identifying the need of a potential number one ruck to take the team forward, Geelong recruiters selected 25-year-old Darcy Fort, a sublime tap ruckman from Central Districts in the SANFL. Having played locally for the Geelong Falcons and South Barwon previously, Fort will be given every opportunity to make the ruck position his own, and it will definitely make for interesting viewing once the JLT Community Series begins in February. Like Blicavs, the injuries to defenders Lachie Henderson and Harry Taylor helped fast-track the development of young rookie Jack Henry. In his second year on the list, the Geelong local came in for his debut in Round 2 and played every game from then on, securing a rising star nomination in Round 7 after hauling in 11 marks and amassing 18 disposals against the GWS Giants. Fantastic at chopping off opposition attacks due to his intercept marking, Henry was thrown forward late in the season and booted eight goals from five matches, highlighting his versatility. Another Cat who made a genuine splash in his debut year was Esava Ratugolea. Named for his first match in Round 1, the 197cm tall impressed with his marking ability, able to take big contested grabs with his vice-like hands. He also displayed great versatility by being able to go through the ruck, but sadly his year was cut short in Round 10 when he went down with a broken ankle. The 20-year-old is hoping to be fit come Geelong’s opening game against Collingwood. A top 10 selection at the 2014 national draft, exciting Indigenous speedster Nakia Cockatoo has only managed to eke out 34 matches in his four years on Geelong’s list, struggling with a range of injuries and illnesses in his time at the club. After a range of hamstring complaints limited him to just 11 games in 2017, Cockatoo suffered a PCL injury to his knee in Round 3, before aggravating it again when he attempted to return via the VFL a couple of months later. With his body constantly letting him down, even Cockatoo’s health took a hit. The youngster had his tonsils removed in November, sidelining him for two weeks, which also gave his body time to rest after he was pulled from training after experiencing soreness in his troublesome knee and calf. Out of contract at the end of this year, Cockatoo will need to show that his injury worries are a thing of the past if he is to stay at the club. After his commitment and motivation to being a professional footballer were questioned in recent eyars, Luke Dahlhaus opted to sign with the Cats as an unrestricted free agent at the end of last season. Originally drafted from the Geelong Falcons, Dahlhaus will be itching to prove many of his critics wrong. The tenacious 26-year-old is capable of playing in the middle and on the outside pushing forward, a position he is likely to hold in 2019 given the Cats’ powerful midfield. Another player returning back to his local area is Cobden-born Gary Rohan. After 106 games and 96 goals with the Sydney Swans, the fleet-footed Rohan will be hoping to add some speed and x-factor to the Geelong forward line. Not a big possession-winner, Rohan must be willing to make every touch count if he is to get the best out of a career that has been somewhat underwhelming so far. With the 15th selection at last year’s national draft Geelong managed to snare one of the biggest steals of the night by securing Jordan Clark from Western Australia. A budding cricketer, Clark decided to hang up the bat and instead pursue a career in football. A dashing half-back flanker who isn’t afraid to take the game on, Clark impressed in his final under-age year, starring for Western Australia in the Under-18 Championships which saw him named MVP for the state. He also managed to play senior footy for Claremont, which points to the 18-year-old being a ready-to-go prospect for the Cats in 2019. In the world of Supercoach, they don’t come much bigger than Patrick Dangerfield. 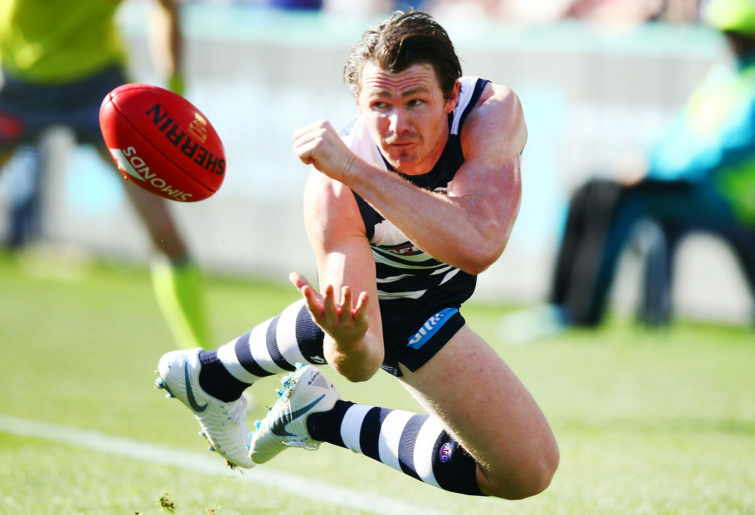 The Brownlow Medallist was not up to the same high standard he set in his first two years with Geelong – his disposal average dropped to 28.1 per game, and he kicked 24 goals after managing 45 in 2017. Yet still, his Supercoach average remained a very healthy 121.7 points per match. While he will take a hefty chunk out of your salary cap, you must remember what you’re getting with the former Crow: extreme consistency and an excellent captaincy choice. In 2018, Dangerfield’s lowest total in a game was 94 points, which he scored twice. They were his only double-figure scores for the season. You just can’t knock that back. The opening eight weeks of Geelong’s season will give a true indication as to where this team fits in the pecking order amongst the other teams across the league. After a blockbuster Friday night encounter against last year’s Grand Finalists Collingwood at the MCG, the Cats will take on seven more sides who finished in the top 12 of the ladder in 2017. Commercially, Geelong have their usual Easter Monday clash with Hawthorn in Round 5, while they will feature in three Friday night games and one Thursday night match. As they did last year, the Cats will play in front of their home crowd at GMHBA Stadium nine times, while they have seven games split across both the MCG and Marvel Stadium. The rest of their matches see Geelong go to Adelaide on two occasions, Perth once to take on the Dockers, Queensland twice and one match in Sydney against the Swans. The Hawks and Swans are the two top eight sides the Cats will encounter twice in 2019, with the other double-up matches against the Kangaroos, Crows and Bulldogs. Nothing major to note with Geelong’s fixture, but interestingly the AFL have scheduled the Cats to face Hawthorn on a Sunday afternoon in Round 18 at the MCG. It will be the first time since 2007 that the two sides have met on a Sunday. Their heavyweight bouts are usually reserved for Friday nights and Saturdays. 2019 will mark ten years since the famous Matthew Scarlett toe-poke that led to Paul Chapman’s game-winning goal over St Kilda in the Grand Final. The Cats will celebrate the anniversary of their eighth flag in Round 17 when they host the Saints on a Saturday night at GMHBA Stadium, a venue St Kilda haven’t won at since 1999. It promises to be a good night for all wearing the blue and white hoops. With a 1-9 record in games being played after a bye since the 2012 season, Geelong supporters will shake and quiver at their Round 14 match-up against the Power at the Adelaide Oval. Not only will the Cats be trying to reverse a horrible post-bye hoodoo when they take on Port Adelaide, they will be doing so in an extremely hostile environment. Geelong’s 3-1 record over Port at the Adelaide Oval gives them a small advantage. For a long time, the Cats have been a team going nowhere fast under Chris Scott. While he can do enough most years to guarantee a top-eight finish (Geelong have missed the finals just once since Scott took over from Mark Thompson at the end of 2010), Geelong have been perennial failures in September, holding a 3-9 record in finals since the 2011 flag. While the Cats have elite top-end talent such as Patrick Dangerfield, Tim Kelly and Joel Selwood, its the ‘bottom six’ that need to start pulling their weight to ensure Geelong are a tough team to play, week in week out. Set for more of a permanent forward role in what is likely to be his final season, can Gary Ablett, once again, be the key to a successful season for Geelong?